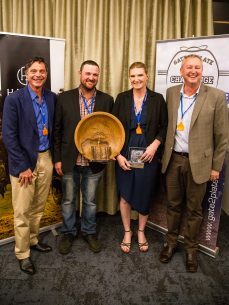 The 4th annual Harvey Beef Gate2Plate competition concluded on Friday night with local WA cattle producers Sandy & Narelle Lyon of Willyung Farms winning the overall competition with their Angus Sussex cross. Over 200 local cattle producers, industry figures and sponsors attended the awards ceremony last night, which was held in Centennial Park, Albany. Winners Sandy & Narelle Lyon of Willyung Farms entered the competition with 2 steers and a heifer all of which were Angus Sussex cross. Last year’s winners were Doreen & Allister Lyon, Sandy’s parents who have been farming at Willyung since 1975. 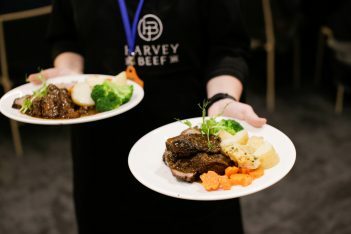 The Harvey Beef Gate2Plate competition assesses cattle performance through the grain-fed, MSA graded, domestic supply chain in Western Australia and aims to improve the eating experience for beef consumers by putting exceptional quality beef on the plate. It aims to reflect as closely as possible the real-world production of beef cattle entering a grain finishing program aimed supplying the domestic supermarket trade and utilising the MSA grading system. All competitors receive detailed feedback on individual and group animal performance at each stage throughout the competition and this enables them to compare the performance of their own cattle against others on a level playing field and assess the suitability of their breeding for the intended market. Cattle are processed at Harvey Beef where they are graded and assessed to find an overall winner. After taking out best carcase in the Beef Australia 2018 carcase competition, it was another win for AS & M Campbell taking 1st place in the Team with the Best Processor Performance category. As is customary the awards ceremony dinner featured beef for both entrée and main course – beef koftas to start, followed by a main of roast beef sirloin and slow cooked beef cheeks, with smashed potatoes, broccoli and carrots. This year chefs Iain & Jo MacInnes of Kooka’s Catering based in Albany created these delicious dishes, which were served by students from Great Southern Grammar school and enjoyed by all the guests.